Tomorrow, the Boston Red Sox will open their 2013 season in the Bronx against their arch rival, the New York Yankees. 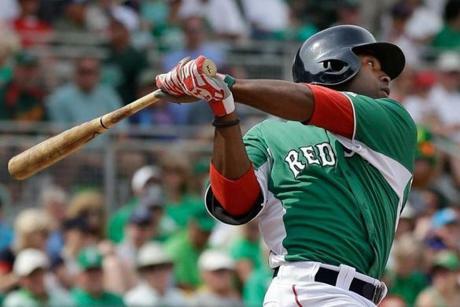 News broke today 22 year old Jackie Bradley, Jr. made the Opening Day roster after an amazing Spring Training. For the past two months there has been much debate on sports radio, in the newspapers, and all over the blogosphere about whether to promote Bradley, Jr. to the big show or start out the season in Pawtucket. Because of the way Major League Baseball contracts are structured, Bradley, Jr. making the team is significant for the next 6 years. Bradley, Jr. will need to spend at least 20 days in Pawtucket at some point during this season to ensure he is still under Red Sox control in 2018. I am completely in favor of Bradley, Jr. making the Opening Day roster. It is not because he gives the Red Sox the obvious public relations boost the organization sorely needs. I am in favor of Bradley, Jr making the team because he was 1 of the best 25 guys in camp. Bradley, Jr. deserved to make this roster. If the Sox had of kept him in the minor leagues just to ensure they keep him under team control an extra year, it would send a terrible message to the players in the organization. I don’t condone the idea of essentially punishing someone that busted their behind all spring by sending them to the minors. Bradley, Jr. is expected to start in left field. Jonny Gomes will be the team’s designated hitter until David Ortiz is ready to come off the disabled list. Things will get rather interesting when Ortiz does come back. Does Bradley, Jr. stay in Boston? That question will not be answered for a few weeks. Until that time, we as Red Sox fans should enjoy the ride with Jackie Bradley, Jr. He is going to energize the lineup. Also, the outfield of Bradley, Jr., Ellsbury, and Victorino has to be the best defensive outfield in baseball. The three of them will cover ground like no other trio in the history of baseball. Jackie Bradley, Jr. has been compared to Derek Jeter when it comes to his character by Buster Olney. As a Red Sox fan, I can’t help but be excited about this kid’s potential. Over the past two seasons, I have been an extremely bitter Red Sox fan. My disdain for Larry Luchhino knows no bounds. The epic September collapse in 2011 coupled with the Bobby Valentine era has caused steam to burst out of my ears. But now I actually come into 2013 with tempered optimism. I do not expect the Red Sox to make the playoffs in 2013. But I do think I will embrace watching a team that appears to enjoy playing the game of baseball. I look forward to seeing the development of Will Middlebrooks and Jackie Bradley, Jr.
Here’s to the 2013 Red Sox!